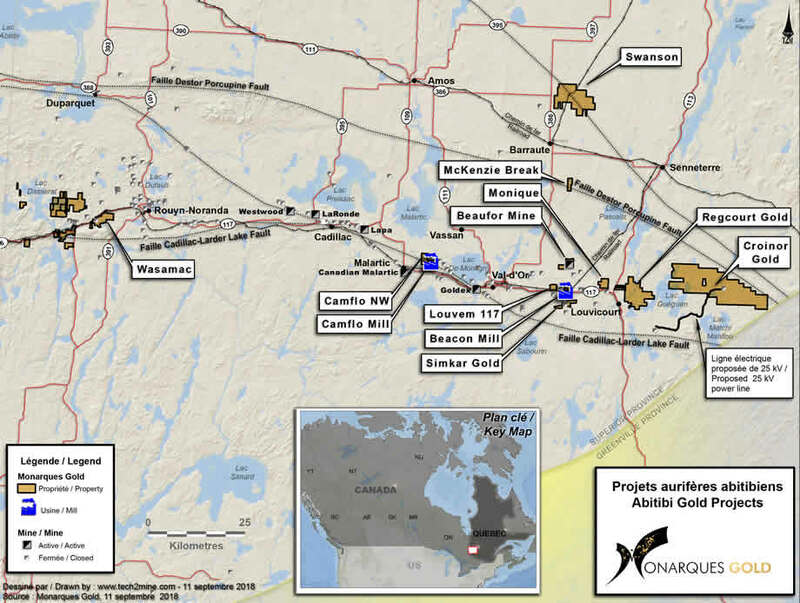 Monarch Gold holds a 100% interest in the Wasamac property, which includes three mining concessions and 12 mining claims covering a total area of 7.6 km2. The property is located in Beauchastel township at about 15 km west of Rouyn-Noranda, in the heart of the Abitibi gold mining camp in the province of Quebec. Solid output: Annual average gold production of 142,000 ounces over 11 years. High return: Pre-tax internal rate of return of 23.6%, net present value of $522 million and payback period of 3.6 years. Low production cost: Production cash costs of $720/oz (US$550/oz) and all-in-sustaining costs of $826/oz (US$630/oz). 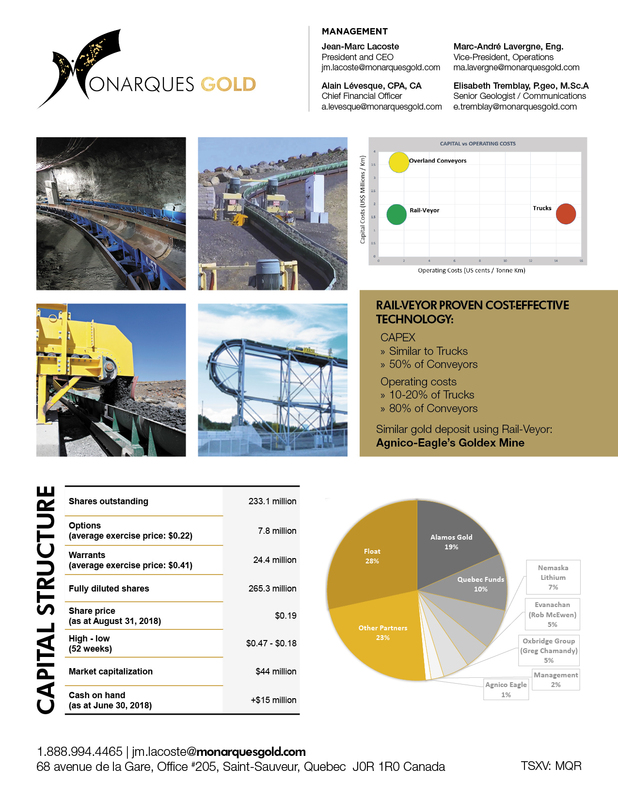 CAPEX: Initial capital expenditures of $464 million, including about $230 million for the mill and tailings facility. Strategic location: Mine infrastructure to be located on newly acquired land next to the Trans-Canada highway and 200 metres from the railway leading to all the main custom milling facilities. Strong exploration potential: Deposit largely underexplored at depth and along strike. Source: NI 43-101 Technical Report, Feasibility Study of the Wasamac Project, Rouyn-Noranda, Quebec, Canada, December 3, 2018, prepared by Carl Caumartin, P.Eng., BBA Inc., Alain Dorval, P.Eng., BBA Inc., John Henning, P.Eng., BBA Inc., Richard Jundis, P.Eng., BBA Inc., Luciano Piciacchia, P.Eng., BBA Inc. and Tudorel Ciuculescu, M.Sc., P.Geo., Roscoe Postle Associates Inc. 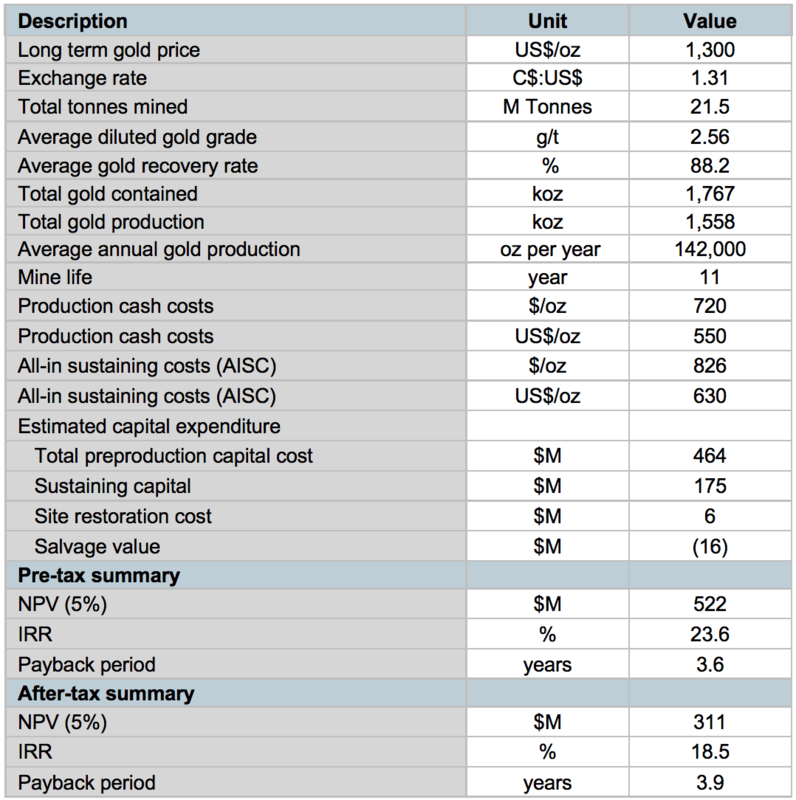 The project’s sensitivity to the price of gold shows that an increase of just 20% in the price of gold brings the pre-tax NPV close to $900 million and the IRR above 30%. Concurrently, a drop in the price of gold of 20% would keep the project comfortably above the break-even level of $925 and the IRR would still post a low double-digit return. The mineral resources used as the basis for the feasibility study are summarized below. Mineral Resources are estimated at a cut-off grade of 1.0 g/t Au. Mineral Resources are estimated using a gold price of US$1,500 per ounce, and exchange rate of US$0.80 = C$1.00. A minimum mining width of four metres was used. A bulk density of 2.8 g/cm3 was used. Mineral reserves were classified complying with the CIM definition standards for mineral resources and mineral reserves. 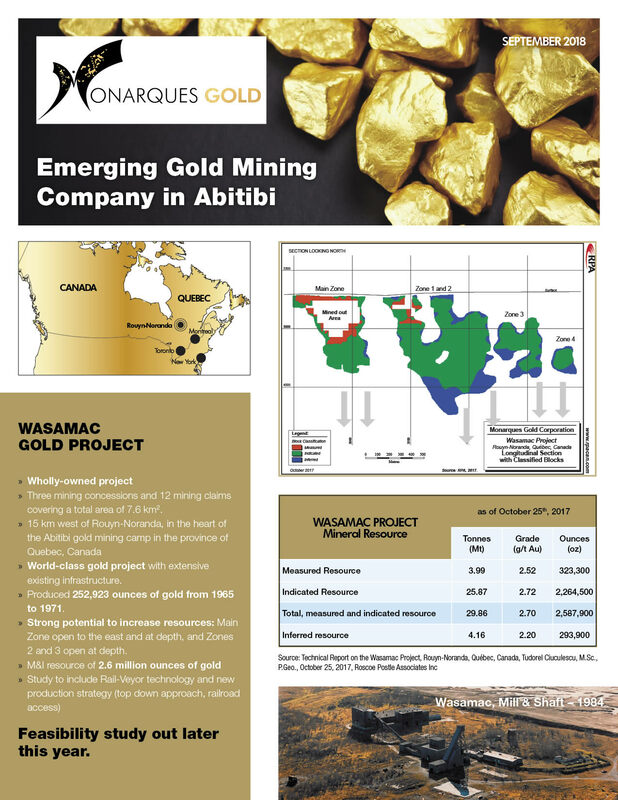 Mineral reserves for the Wasamac deposit incorporate dilution and mining recovery factors based on the selected mining method and design. Mineral reserve is the estimated tonnage and grade of ore that is considered economically viable for extraction. 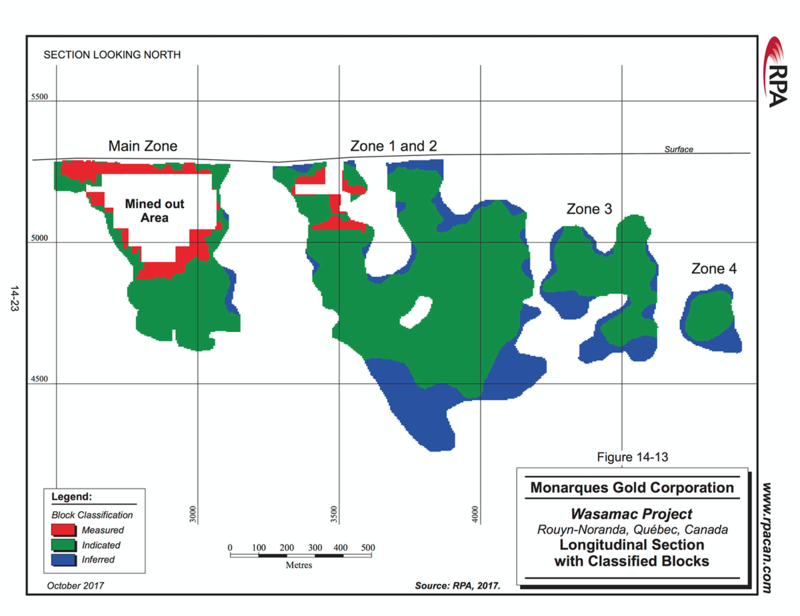 The mineral reserve estimate for the Wasamac deposit is based on the resource block model provided by RPA to Monarch in 2017, along with the information in the Preliminary Economic Assessment study conducted by RPA in 2012 for the previous mine owner, Richmont Mines Inc. The price of gold is determined to be US$1,300/oz. The trailing average exchange rate of 1.31 C$/US$ is used in cut-off grade determination. Mineral reserves were estimated from the resource block model provided from RPA, using software-generated optimized stopes based on an estimated 1.0 g/t cut-off grade. 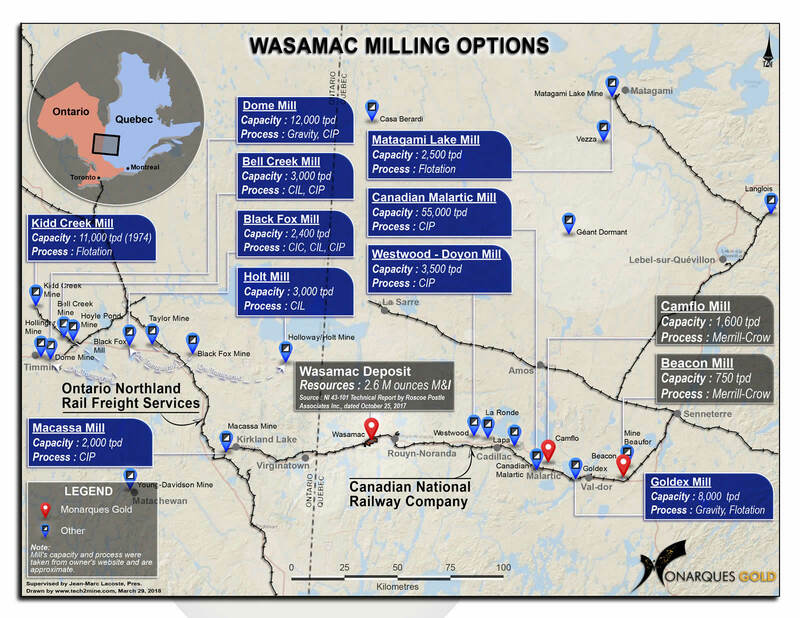 There are significant opportunities that could improve the economics and the timetable of the Wasamac project. The major opportunities identified at this time are summarized in the feasibility study. Further information and assessments are needed prior to including these opportunities in the economic evaluation of the project. The Wasa shear zone runs east-west through the centre of the property. This shear zone, which trends at an azimuth of 265°, has a 50-60° dip to the north and a maximum thickness of 80 metres. To the west, the shear zone splits into two separate branches and becomes thinner, while to the east, the shear zone weakens as well and displays an average thickness of 25 metres. This shear zone is characterized by the development of a strong mylonitic fabric and an intense hydrothermal alteration which completely destroyed the primary structures and textures of the protolith. Mineral assemblages of rocks within the shear zone consist of chlorite, carbonate, hematite, albite and sericite in the middle of the zone. Gold is associated with a dissemination of fine pyrite in the altered portions of the shear zone.